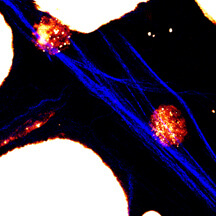 The researchers used an imaging technique to document how increasing fat content causes cancer cells to undergo changes essential to metastasis. Then they used another technique to count the number of cancer cells in the bloodstream of mice fed a high-fat diet compared to animals fed a lean diet. The findings suggest that the combined tools represent a possible new diagnostic technique to determine whether a patient's cancer is spreading, said Ji-Xin Cheng, an assistant professor in Purdue's Weldon School of Biomedical Engineering and Department of Chemistry. "It is generally accepted that diet and obesity are accountable for 30 percent of preventable causes of cancer, but nobody really knows why," Cheng said. "These findings demonstrate that an increase in lipids leads directly to a rise in cancer metastasis." Researchers have theorized that tumor cells need more lipids than ordinary tissues to provide energy and material for tumor growth and metastasis. "Before this work, however, most of the evidence was anecdotal, but here we present a mechanistic study," said Thuc T. Le, a National Institutes of Health postdoctoral fellow at Purdue who is working with Cheng. Findings were detailed in a paper published on Jan. 30 in the journal BMC Cancer. The paper was written by Le; Terry B. Huff, a graduate research assistant in Purdue's Department of Chemistry; and Cheng. The research is supported by the Purdue Cancer Center. The researchers implanted a cancerous lung tumor under the skin in each of the mice studied, and the animals were separated into two groups: one fed a high-fat diet and the other a lean diet. The researchers then used an imaging method called coherent anti-Stokes Raman scattering, or CARS, to document how increasing lipids from fat intake induces changes to cancer cell membranes. Those changes, including processes called membrane phase separation and membrane rounding, enhance cancer metastasis. "If the cancer cells don't have excess lipids they stick together and form very tight junctions in tumors, but increasing lipids causes them to take on a rounded shape and separate from each other," Le said. The change in shape is critical to the ability of cancer cells to separate and spread throughout the body via the bloodstream. The researchers then used another technique, called intravital flow cytometry, to count the number of cancer cells in the bloodstream of the mice. The technique works by shining a laser though the skin and into blood vessels, where the dyed cancer cells are visible. Results showed the increase in lipids had no impact on the original tumors implanted in the mice. However, the rate of metastasis rose a dramatic 300 percent in the mice fed a high-fat diet. The researchers later also examined the animals' lungs and counted the number of cancer cells that had migrated to the lungs as a result of metastasis. Those findings supported the other results showing increased metastasis in animals fed a high-fat diet. The researches used the imaging and cell-counting tools to document that linoleic acid, which is predominant in polyunsaturated fats, caused increasing membrane phase separation, whereas oleic acid, found in monounsaturated fats, did not. Increased membrane phase separation could improve the opportunity of circulating tumor cells to adhere to blood vessel walls and escape to organs far from the original tumor site. The new findings support earlier evidence from other research that consuming high amounts of polyunsaturated fat may increase the risk of cancer spreading. The findings suggest that combining CARS and intravital flow cytometry represents a possible new diagnostic tool to screen patients for cancer. The tool can be used to count lipid-rich tumor cells circulating in a patient's blood by shining a laser through the skin and into blood vessels. Because lipids can be detected without the need for dyes, the technique might be developed into a convenient method to diagnose whether a patient's cancer is spreading aggressively, Cheng said. "These findings open the possibility of an entirely new, relatively simple method for diagnosing whether cancer is metastasizing," he said. Future work will focus on not only how obesity increases metastasis but also how it might play a direct role in initiating the development of cancers.